Over the years, there have been quite a few collateral relatives, for one reason or another, I've semi adopted. One in particular, Lyman Thorp, has always been one of my favorites. Born in Watertown, New York in 1827, Lyman was the third son of Ebenezer Hudson and Lucinda (Gray) Thorp. He led a pretty decent life for being a deaf mute in the 1800’s. He attended school, always seemed to have a job at census time, and even married and had three children. 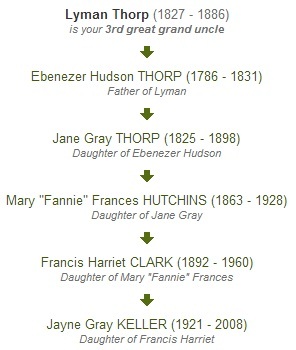 After I found Lyman’s Missouri death record (struck by locomotive in Knob Noster, Missouri), I always wondered why my 3rd great-granduncle was so far from his Tecumseh, Michigan home at the time of his death. Earlier this year, I finally found out. 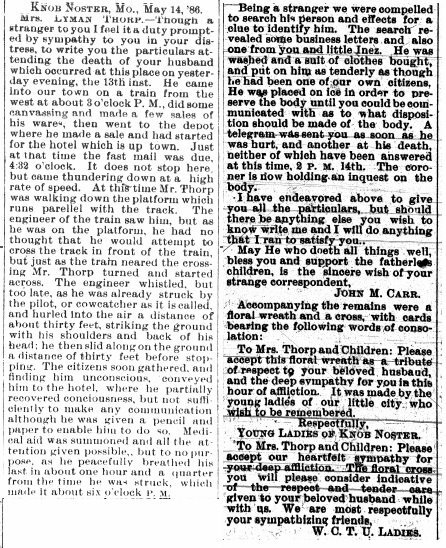 I came across this newspaper article containing a letter written by an upstanding Knob Noster citizen, John Carr, to Lyman's wife, Pluma, who was also a deaf mute. Mr. Carr was kind enough to report the unfortunate last few hours of Lyman's life. Fantastic Find/Letter/Story!!!!! :) How touching of a letter!!!!! It was so nice that Mr. Carr took out the time to answer questions that I am sure she had... Like, How did this happen? Did he suffer? How long did he live? Did he have any last words etc..... Wow.... You lucky rascal you!! !